Comparing RailKing "people" and true O scale figures. 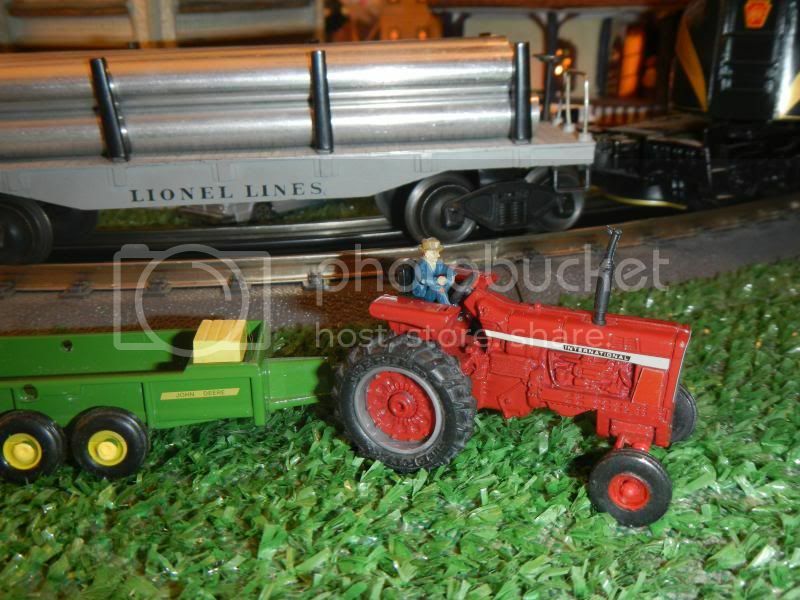 Photo shows a RailKing figure with a true O scale figure. Pre McDonalds Big Mac. Post McDonalds Big Mac. In my world most of you people are Railking size ! They're both too short for me @ 6'-4". Where do the Lionel Polar Express people fit in? If at first you DO succeed,try hard to hide your astonishment. Of course you wouldn't try fitting the guy with a hammer in your O Scale SP Daylight passenger car - maybe on the station platform (if you're lucky enough to have one). I support short people although I don't count myself as one of them; the Railking figures are the best for passenger car interiors. Although the RailKing people may be a bit small, the sitting figures work the best of all brands in passenger cars. A study a forum member did a few years ago showed every makers 6' man was a different size. Railking people are a bit small yes, but I usethem for children, and a lot of them for folks who fit in passenger cars, 1:43 buses and buses easily: not easy to get the full size figures in. Its funny but when I purchase O gauge people, sometimes the ones on the smaller end look good and at other times the larger figures look better. I believe that it depends on the setting and how the perspective looks to the eyes. Builder of the Hill Lines ( New Delta Lines). Recreating history for the model RR community. My experience with passenger cars is the smaller ones pretty universally look better in the cars. All of the true 1:48 scale people sit so tall in the seats that you see their chest through the windows. I must admit that my first reaction was, so what! From more than 3 feet away, who cal tell the difference, when your layout has various people standing, and/or working all over the place? I can tell the difference between seeing the passenger's heads or their chest through the windows. I guess I just have sharp eyes. I believe that MTH's people and Artista's figures are both way undersized. As well done as they are, they only look good, in my eyes at least, if they are grouped together by themselves with no true-sized figures around them. I don't buy either for just that reason. The shorter figure is actually perfect for S gauge (1/64 scale). The shorter figure at 4.5 feet in O scale (1/48) must measure 1.125 inches in reality. The question then is "How many 3/16 are there in 1.125 inches? Both figures now measure 6 feet tall. S scale on the left, O scale on the right. When they were passing out brains, I thought they said trains and I asked for a slow one. I've used some of the Chinese 1:75 figures and just touched them up to give some facial features for many of them. I also had some S-scale ones that fit perfectly, but I haven't found any more of those recently. 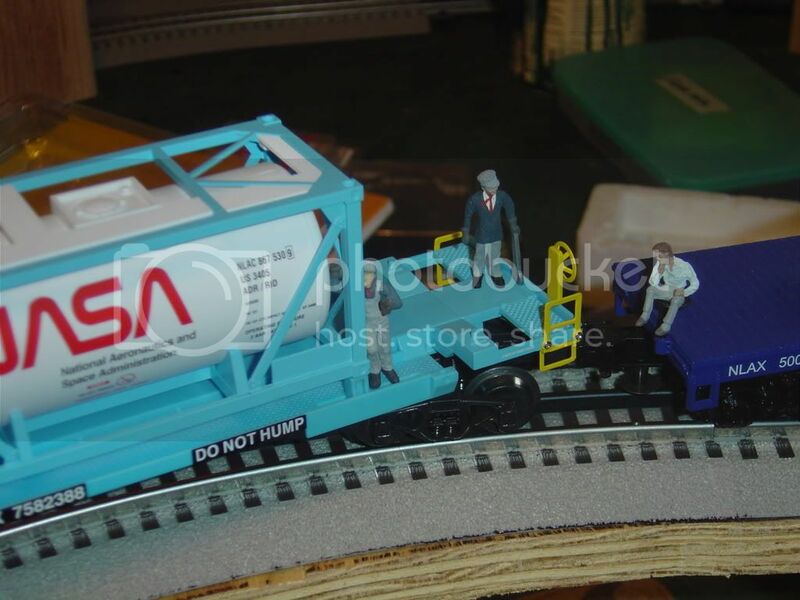 I think the MTH Railking figures are about the right size, but I don't want to have to paint them totally. I find that ALL 'O' scale people are different sizes.....from really small to really big. I just do as lee does......either place like size together or use as appropriate. Just like in real life.....many different size people and ages. Yet to be REALLY disappointed with any I've bought. 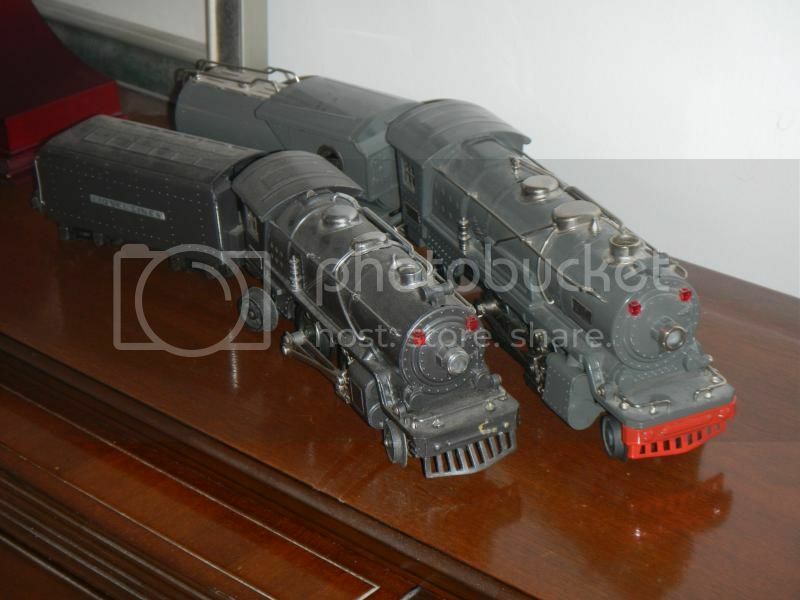 So based on Kim Kars pictures today, she's Railking on top and True O scale below? Where would railroads be without road side tramps. In my Tin Plate child like layouts I have many different size people, animals, tractors and other vehicles, I have never counted rivets on my layouts so exacting size means little. After all original Tin comes in different sizes, even the engines, tenders and rolling stock. Never worry about what other people think, be strong and walk in the way of the Lord. I have avoided buying the value packs of 100 people or so (mostly from China) on the Bay for this very same reason. I have notice at my LHS that the Rail King folk are undersized. The painted folk that sell for $33 a set of 6 (German) are BEAUTIFUL but way out of my price range. There are a number of RailKing accessory items that are actually 'S'. They are made with tooling MTH picked up when Flyer was selling it to try and stay afloat before they finally went under. Most of it has been shifted from RailKing 'O' to the new MTH 'S' catalog. The Gilbert Gallery has pictures of the originals if you want to compare to the MTH 'S' catalog. 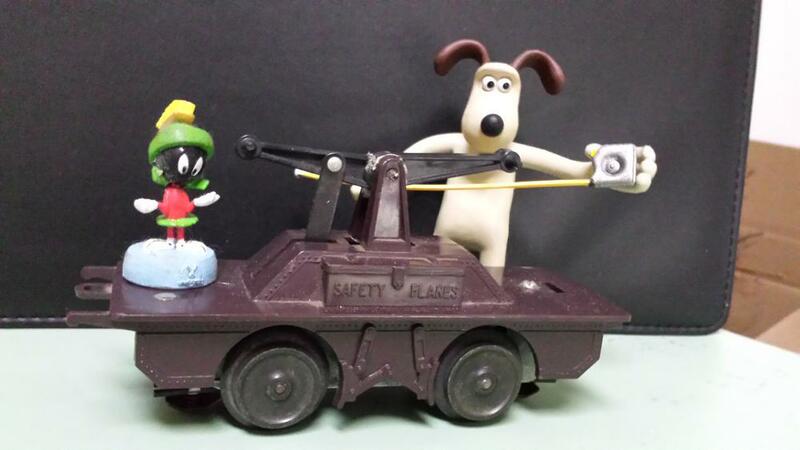 So if Marvin is an inch and a quarter tall, my O gauge handcar is really a narrow gauge G scale car? Sorry, didn't mean to imply Mike purchased the tooling directly from Flyer, just MTH had some of the old tooling. Flyer was selling off some tooling to raise cash before the Lionel takeover. My understanding is Mike got some of that tooling 2nd or 3rd hand from the folks that got it from Flyer, or from people who got it from them. I believe the Hobby Surplus folks got a pile of original Flyer parts in a similar fashion. Personally not a stickler to scale but I like things to be somewhat proportioned. My main layout is 2 O-31 elongated loops- the inner usually runs a prewar consist- but I still try to keep my vehicles between 1:43 and 1:50. For my figures, at some of the larger stations/structures they are bigger but not by much. 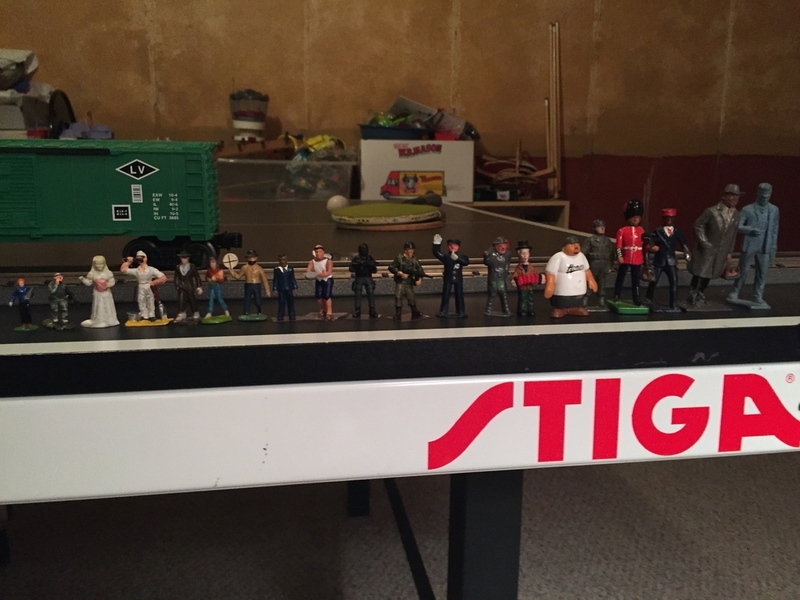 Besides that, I have an assortment of figures from model power, ertl, o-line reproductions, K-Line scale, some RMT, and Johilco which is surprisingly close to the o-line reproductions which are the closest I’ve seen to O-Scale. 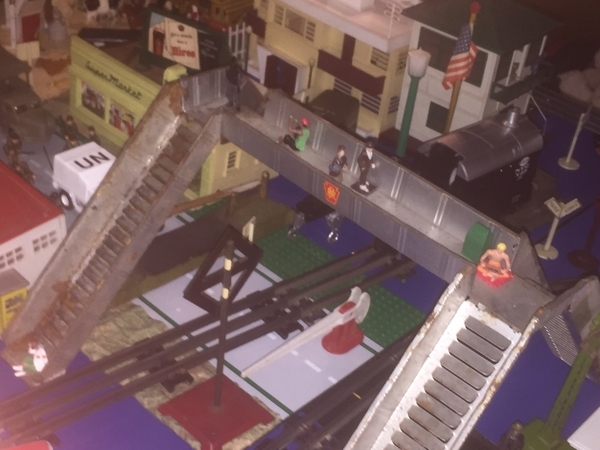 In the other part of my layout, it’s more toy-like, a lot of Plasticville and 1940s or 50s vehicles. Also has plasticville figures, some Flyer figures, 1:64th scale corgi soldiers. Im going home today and some MTH Railking Soldiers will be awaiting me. REALLY hoping that their close to O-line reproductions in size. For reference: (left to right) Ertl County Fair playset, Corgi 1:64th Scale Marin, Bride by American Flyer prewar figure, plasticville figure, model power woman, diecast Flyer figure from set 578, O-Line Reproductions “Station Figures” set man in suit, Model Power “Poor People set” man begging for money or food, K-Line O-Scale SWAT figure, O-line repro soldier, Johilco Station figure, Johilco Hono, Lemax acordion player, Homies figure, US Army Soldier unknown make, WB Britain’s Royal Scott’s Guard, Station Porter by Lincoln logs, Barclay STD. Gauge man waiting for train, Auburn Trains(NOT AMT/Auburn- the Auburn who made Rubber Toys) worker checking the clock. Haven’t heard of those German figures. Can you provide a link or company name ?? I think that he's referring to figures made by Preiser and a Google search for "Preiser O scale figures" will get you started. But Preiser actually specializes in other scales so the O inventory available is often limited/out of stock for extended periods. They are very nice figures but rather large for the inside of most 3rail O cars. I'm not particular about size. I love all of them, both on and off the layout. Wild Mary (AKA Nick) Retired & "Riding The Wild Mary"
When visitors have come over to see my layout they haven't shown up with a ruler so far. Any layout is seen in the context of the whole as if you are seeing a stage show. All detail comes together for a complete effect. If something is a bit out of size it probably won't be noticed. If its the people size that concerns you, just tell them that some of the people are midgets. I bought a bag of 1:50 Chinese for like $14.00 freight included. Put all in my 12 Atlas Zephyr cars and they, less legs, look great. If something is a bit out of size it probably won't be noticed. The big one is a Nephilim.